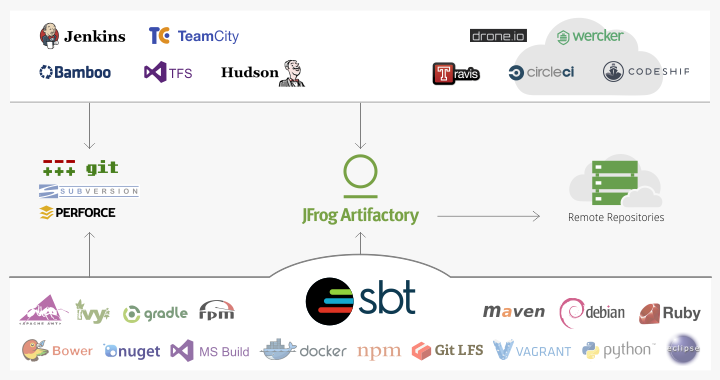 Whether you’re developing with Java or Scala, using Artifactory with SBT makes your builds faster and more reliable. SBT can be configured to resolve artifacts through Artifactory by modifying properties in the build.sbt. And to make things really easy, Artifactory can even generate the corresponding code snippets directly from its UI. It’s easy to configure Maven and Ivy proxies as remote repositories in Artifactory for SBT. Running SBT builds through Artifactory can reduce build times significantly by reducing networking. This is because Artifactory stores remote artifacts locally in remote repository caches, so once an artifact has been cached, it is locally available for builds without the need for any networking. Running SBT with Artifactory also makes builds more reliable, because any dependency on remote repositories, or the external network has been removed. Even if a remote repository goes down, or if there is an issue with the external network, the build will succeed since remote artifacts are available from the local cache.